If you are tempted to do so, please don’t! Covering your window with plastic is not a “quick fix” and will only lead to more problems. Your vehicle’s side windows serve very important functions. They provide visibility while driving; add to the structural stability of your vehicle; and, most importantly, protect your passengers from impact and outside objects. When your side window is missing, or is otherwise damaged, these functions aren’t being served—and a piece of plastic isn’t going to serve them. Don’t put yourself and your passengers at risk by postponing service. Most vehicle owners who put plastic on their windows use some type of tape to keep it in place. Tape, however, is temporary and does not result in a complete seal. It can cause a variety of damage to your vehicle, from cosmetic damage, or “scuffs,” on your paintwork or interior to water damage from leakage. Postponing window repair or replacement could prove more costly in the long run. Save yourself the money—and frustration—and schedule window repair or replacement as soon as possible. Winters here in the greater-Pittsburgh area can be harsh, and plastic can only keep out so much cold. If your side window is damaged during the winter months, you and your passengers will be exposed to freezing air temperatures and airflow—and when you turn up the heat to get warmer, you’ll burn through your gas quicker and put more overall wear and tear on your vehicle. The same goes for the summer and using your AC to combat the heat. Plastic can’t insulate your vehicle like glass can and will only put unnecessary strain on you and your vehicle, which will likely end up costing you more time and money down the line. Covering your window with plastic is like painting a bullseye on your vehicle. Plastic is a lot easier to “break” than glass. All a thief has to do is tear it open or pull it away, then they have access to your vehicle and everything inside it. Only glass can keep thieves, vandals, and vagrants out as intended. When your side window breaks, don’t be overwhelmed. Getting it fixed isn’t as complicated, time-consuming, or costly as you may think it is—and taking prompt action is your safest option. 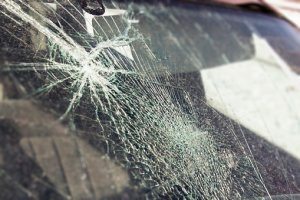 Three Rivers Auto Glass has been providing premier windshield repair, windshield replacement, and other automobile glass services in and around Pittsburgh for over 40 years. We are experts at auto glass and are renowned for our quick, top-quality service. Call today to schedule an appointment for mobile service, or to bring your vehicle in to any one of our six greater-Pittsburgh area shops. We accept most major insurances and can sometimes work with other companies, and we can give you a free estimate over the phone in as little as five minutes. ← Can I Recycle My Windshield?